The Architecture of Elizabethan Houses was highly distinctive and many examples of Tudor and Elizabethan houses can still be seen in England today. This proves how good the architects and builders of Elizabethan houses were. Elizabethan houses were built to last! The actual architecture of Middle class houses was similar to traditional medieval styles. But Elizabethan Houses were framed with massive upright, vertical timbers. These vertical timbers were often supported by diagonal timbers.The wattle walls were daubed with mortar and whitewash was then applied. 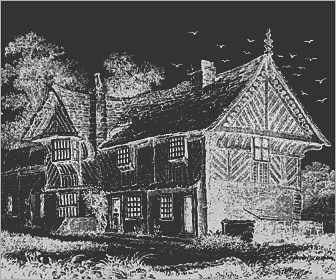 This process resulted in the highly distinctive black and white half-timbered Elizabethan Houses. The tall thin chimneys of Elizabethan houses were often topped with decorative chimney pots with symmetrical patterns. In the Elizabethan houses of the Upper and Middle classes panes of glass were added, replacing horn or wooden shutters, and the interior of homes became lighter and airier. To make a pane of glass was a painstaking process. A blob of glass was blown into a cylinder shaped bubble. The cylinder was placed on a cooling table and cut in half. A small piece of glass was produced. The small pieces of glass for the windows were joined together with lead. The leaded window panes were constructed in a in a criss-cross , or ‘lattice’, pattern. The design was a casement windows. Casement windows were attached to a hinge which opened outwards. Middle or Lower Class Elizabethan houses had thatched roofs. The materials used to make a thatched roof was either straw or reeds. Bundles of straw or reed were piled on to the frame of the roof. The bundles had a circumference of between 24 to 27 inches and could range from 3 to 7 feet long. The roof was the only place for animals to get warm, so all the dogs, cats and other small animals, such as mice, lived in the thatched roof. When it rained the thatched roof became slippery and sometimes the animals would fall off, hence the old English saying "It's raining cats and dogs." In the Elizabethan houses of the Lower classes an important feature, specially in towns and cities, were the overhanging windows in the upper storeys of the houses. The building of such overhangs enabled additional floor and living space which was not subject to ground rent. This led to the houses in cities, such as London, where land was expensive to be built in close proximity to each other forming streets where the overhang windows almost met. This resulted in extremely dark streets where little sunlight was allowed through. 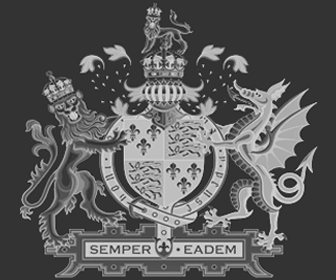 Additional details, facts and information about Elizabethan Architecture can be accessed via the Elizabethan Era Sitemap.